In a microwave safe bowl, mix together the Jello mix and the hot water. Stir until dissolved. If it's not dissolving, microwave the mixture for 30 seconds and keep stirring. Repeat until you get it all dissolved. Add the marshmallows and microwave for another 30 seconds. Mix together until the marshmallows are completely melted. Pour mixture into a greased 8" x 8" pan and refrigerate for at least an hour. Use a knife to cut around the edges of the pan to release the Jello. 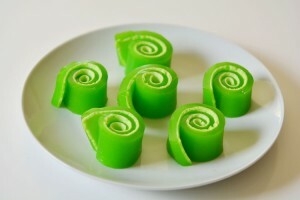 Roll the Jello as tightly as you can. Cut into 1" wide pieces using a sharp, thin knife. The marshmallow will rise to the top of the Jello mixture as it sets, so there's no need to make two different mixtures.